I'm so excited that Turkey Day is coming! I know.. I know.. take it easy, it's not even the middle of the month, but I LOVE LOVE LOVE Turkey day! I love being with my whole family without all of the expectations of Christmas gifts. I love pouring over the Black Friday ads with my mom and sisters, and making a plan for that crazy shopping day. 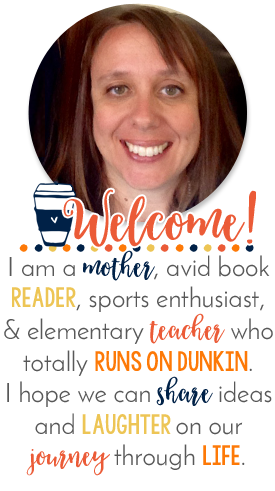 AND I LOVE the writing activity that I do with my students every year for Thanksgiving. We make a Thanksgiving Turkey Survival Kit! A What? A Turkey Survival Kit! We read a few great stories about turkeys who think they are going to BE Thanksgiving dinner, and then we brainstorm ways we can help them survive the holiday. I like to get my families involved in this activity, so I ask them to work together to create models of their items and then bring them in to present to the class the few days before we break for the holiday. It is SO MUCH FUN to see what they come up with.. I can't wait to see it again this year. I wish I had pictures to show you. 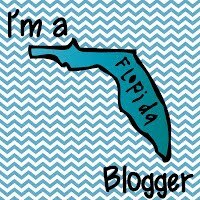 <sad..tear..tear...> I wasn't that good at doing this before I started blogging. So THIS YEAR, I plan to take a few pictures of the process and share them with everyone. 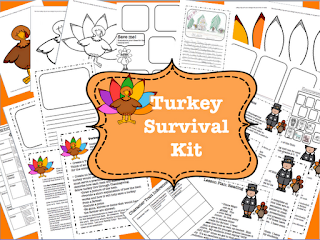 Meanwhile, if you happen to want a new spin on your Thanksgiving activities, the Thanksgiving Turkey Survival Kit is for sale in my Tpt store. It includes activities for 3 stories, inference sheets, rubrics, writing sample, and sequencing activities for younger students. I have done this activity with students from grades 2-7 and they have all loved coming up with fun and creative items to keep the turkey's from becoming dinner! Let me know what your Thanksgiving plans are this year! Happy November! I love turkey day too and you're Thanksgiving Survival Kit looks adorable :)! Thanks Nikki! It is such a riot to watch in the classroom! The kids can be so creative!